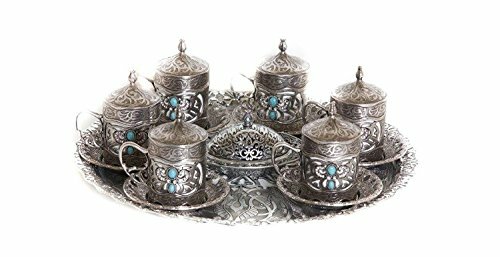 26 Piece Traditional Turkish Coffee Set includes: 6 coffee cups, 6 saucers, 6 porcelain cup insets, 6 cup covers, 1 sugar bowl with cover and 1 serving tray. All pieces except for the cup insets are made of Zinc Alloy, so they will not discolor or rust like brass sets will. Each cup will hold 1 shot of Turkish coffee or Espresso (approximately 100 ml). The round serving tray measures 11" in diameter. Each piece is etched with an elegant design, then polished and painted - creating designs inspired by the Ottoman palace's luxury style. The cup holders have colored stones set into their sides, which further enhances the luxury style. This luxury set will make a beautiful gift for any very special occasion. If you have any questions about this product by Otantik Home Ottoman Design, contact us by completing and submitting the form below. If you are looking for a specif part number, please include it with your message.